Being still an infant but promising field, Bioengineering is looked as a unique and multi-disciplinary field of Engineering. However, there is a lack of information sessions to allow potential students to know more about this field. Being a multi-disciplinary degree program, there needs to be an avenue to explain to the potential students what Biomedical Engineering encompasses. 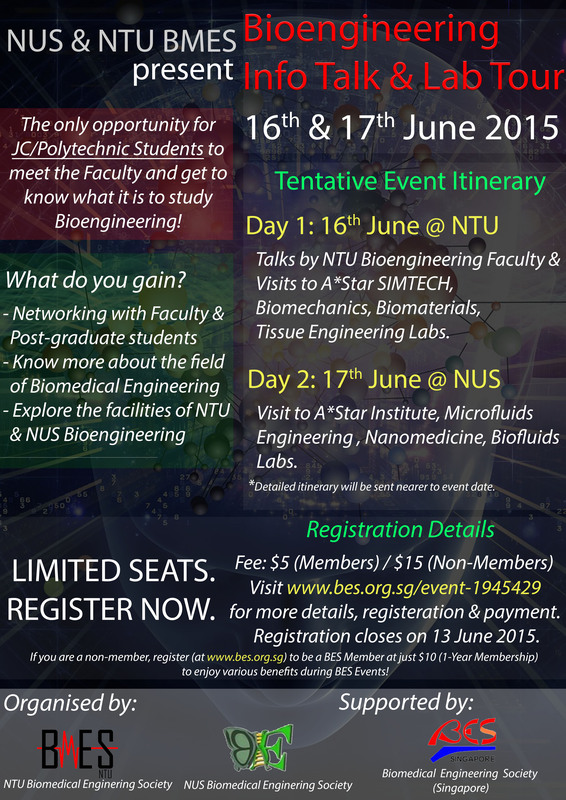 On the 16 June 2015, participants would have the opportunities to hear from and speak to the Faculty of NTU's Division of Bioengineering on the various fields that would be covered in Bioengineering. The Professors have also been requested to share their works/research and their perspective on Bioengineering. After lunch, a lab tour will be conducted in the School of Chemical and Biomedical Engineering. On Day 2, 17 June 2015, participants will head to A*STAR institute and various other labs in NUS' Department of Biomedical Engineering. Please register online. Limited availability! Secure Payment via PayPal. Major credit and debit cards are accepted.